This title is obviously a little confusing since this isn’t technically a full on curry, because it’s a little dryer than having a full on gravy. But nonetheless, it’s absolutely delicious and perfect for fall! 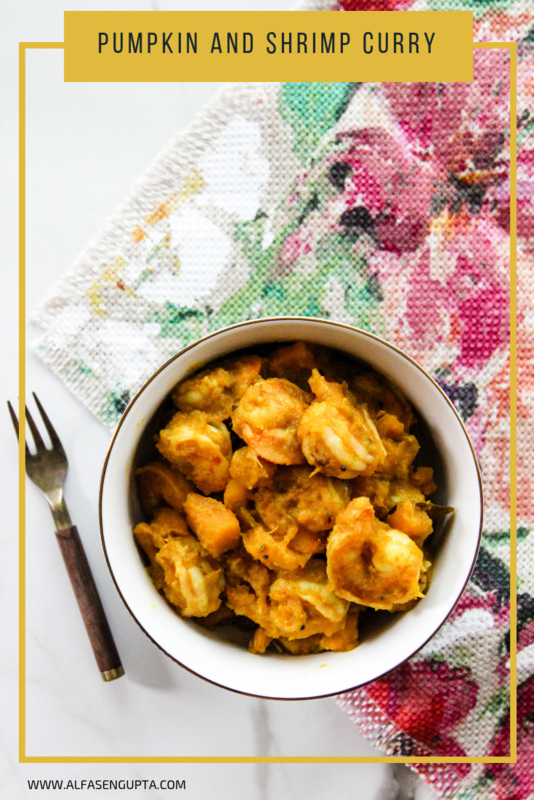 This is one of my favorite dishes that I grew up eating because it’s a pretty traditional Bengali dish. With the new season in full swing, I figured it was time to re-create this dish. Perfect for the fall nights! 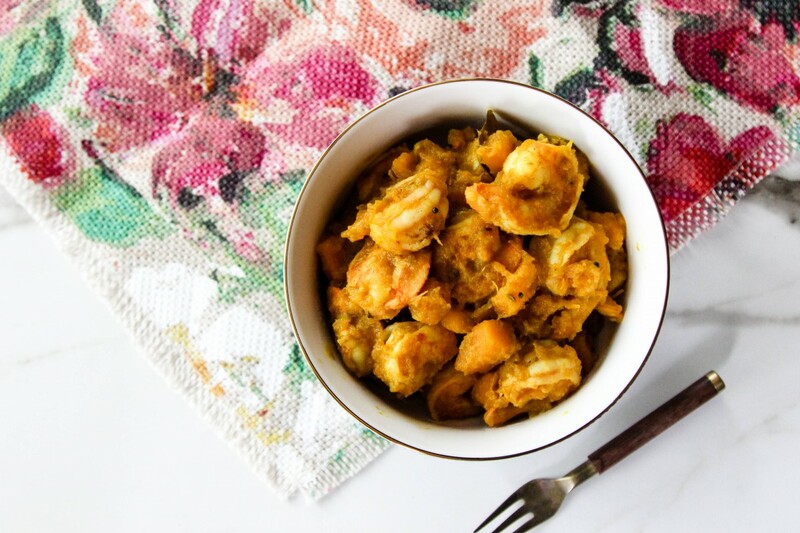 So I bring you, Kumro Chingri, which is basically shrimp and pumpkin curry! I was shocked at how easily and quickly this came together. 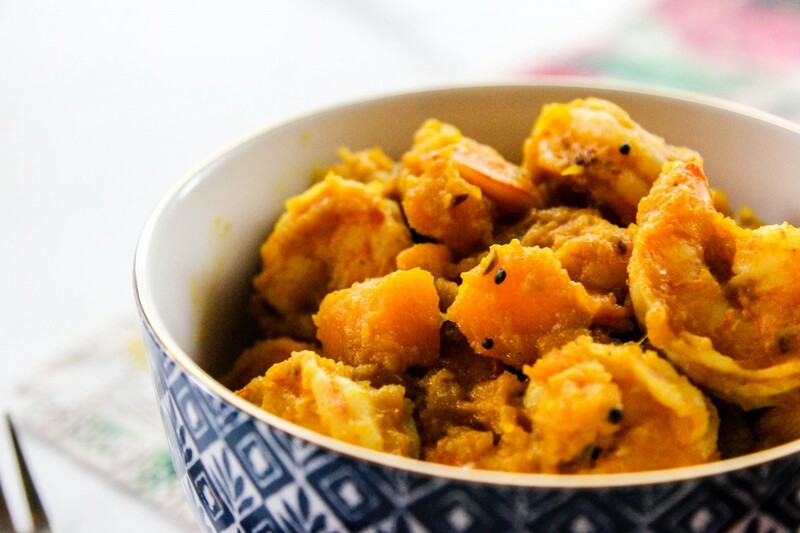 Some Indian dishes can take a really long time, but luckily this one isn’t one of them! I do recommend buying the good, large, unpeeled shrimp for this dish, and actually cleaning and de-veining it yourself. Frozen shrimp just never tastes as good that’s already been peeled. Trust me on this one. It’s worth the extra effort if you’re making anything with shrimp, especially when it is the star of the dish. Start with marinating the shrimp with salt, 1/2 tsp of turmeric, and 1/2 tsp of chili powder. Let it sit for at least 20-30 minutes. While that’s marinating, blend the onion, serrano peper, garlic and ginger to a paste. Set aside. When the shrimp is done marinating, heat 1 tbsp of the EVOO in a non-stick pan and lightly fry each the shrimp in batches and then move out of the frying pan with a slotted spoon. Set aside. In the same pan, add the remaining EVOO, and temper the bay leaves along with the Indian 5 spice. When the spices start crackling, add in the blended mixture. Start sauteing it, and then add the turmeric and chili powder. Fry up the mixture for a little while until it’s a bit drier and not so watery, about 5-7 minutes. Toss in the pumpkin/squash and give it a good mix. Add about a 1/4 cup of water, give it another stir, cover, and let it simmer on low for about 10 minutes. When you take off the lid after the 10 minutes, make sure the pumpkin/squash has softened up. If not, cover again and check back on it periodically to make sure it’s getting softer. Once it’s all soft, add the cooked shrimp back into the pan. Make sure it’s all mixed together really well. 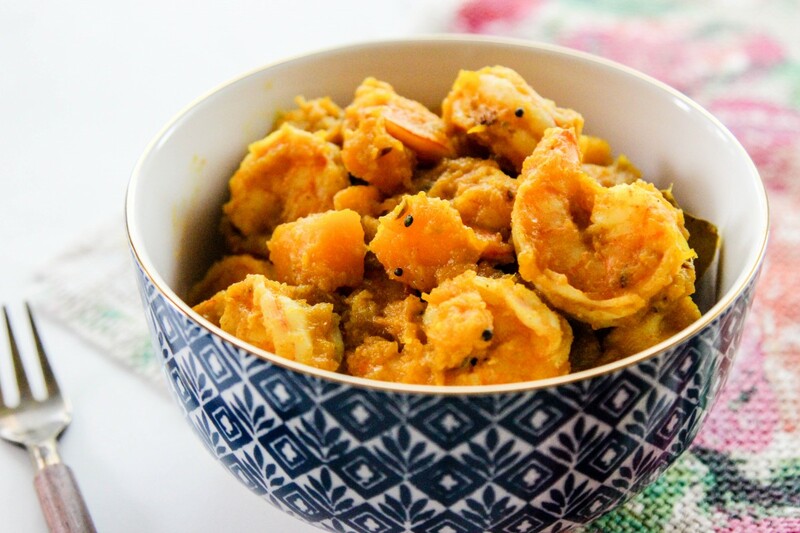 Serve with roti (tortillas) or rice!